The main Athens stock index, the Athex, ended the day down by 16.23% as trading resumed after a five-week closure. 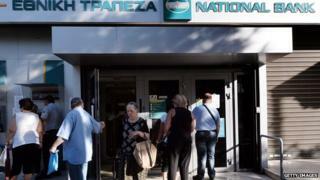 The nation's top four lenders - Piraeus Bank, National Bank, Alpha Bank and Eurobank - fell the most, all down 30%, the maximum allowed. Banks make up about a fifth of the index. The bourse was shut just before Athens imposed capital controls at the height of the debt crisis. It had fallen behind by 22.87% just minutes after opening for trade. The Athex recovered slightly in morning trading, but was still down more than 18% in midday trading. In accordance with conditions laid down by the government and the European Central Bank, local investors are not allowed to buy shares with money from their bank accounts, only with cash kept in safe deposit boxes or at home. Markit's purchasing managers' index (PMI) for manufacturing, which accounts for about a tenth of the economy, fell to 30.2 points, the lowest reading since records began in 1999. A measure of 50 denotes growth. Not long after the market reopened at 07:30 GMT, the Athex had plunged to 615.16 points, down by 182.36 points from the 26 June close. By comparison with other global markets, the biggest one-day fall in the value of the US Dow Jones was 22.61%, seen on 19 October 1987, known as "Black Monday". On that same day nearly 28 years ago, London's FTSE 100 fell by 10.84%, a drop surpassed in history only by the following day's trading, when it declined a further 12.22%. Holly Cook, editor of financial website Morningstar.co.uk, told the BBC that it was "not really surprising that we're seeing all this negativity building up". She said that Greece's economy faced a potentially long road back to recovery. "We need to see what's going to come in the weeks and months ahead," added Ms Cook. Constantine Botopoulos, head of the Greek capital markets commission, told Skai radio: "Naturally, pressure is expected, markets will not fail to comment on such an extensive shutdown." He added: "But we must not get carried away. We must wait until the end of the week to see how the reopening will begin to be dealt with more coolly." Although Greece struck a bailout deal with its creditors last month, political in-fighting in Athens over the conditions could still result in prime minister Alexis Tsipras calling an early election. The Greek economy has begun to reverse the gains it was making before Mr Tsipras's Syriza-led coalition took power in January on an anti-austerity platform. The European Commission expects Greece to go back into recession this year, with the economy contracting by between 2% and 4%. Are you in Greece? Are you a trader? What do you think about the fall in the Athens Stock Exchange? You can email haveyoursay@bbc.co.uk with your views.